Yesterday, we began talking about the Dominant Tree, and how learning to find a dominant tree will improve your chances of getting a shot at a deer. Notice I didn't say "shooting a deer". I can help you get close. Taking and making the shot are up to you. If you are like many of the hunters who have learned to hunt the dominant tree, you may find that with some practice and some success, scouting will become the most challenging and most rewarding part of the hunt. In my mind, hunting takes place before I climb up into my treestand. What happens after that is just shooting. I have found myself passing up shots that I would have taken in the past simply because I feel like I have been successful when a deer shows up under the exact tree that I set up to hunt. So let's back up and review what a dominant tree is. A dominant tree is a specific mast-producing tree - that means that it produces nuts (hard mast) or fruit (soft mast) - that has ripe mast on which deer are actively feeding. Let's break that definition down a little. In most parts of the country where whitetails live, the primary mast producing trees (from a deer's point of view) are oaks. Secondary mast producing tree species include persimmons, locusts, osage oranges, pawpaws, and various other wild and domestic fruit trees. Next, we said that the tree must have ripe mast. Generally, that means that the nuts or fruit have fallen off the tree and are laying on the ground. Third, we said that deer must be actively feeding on the mast. By actively, we mean that there have been deer feeding under that specific tree within the last 24 hours. Finally, we said that we are looking for a specific tree. In other words, we aren't looking for an oak ridge where we have seen deer before, or returning to the hollow where Uncle Ned killed a bigg'un last year. We are looking for that one specific tree where we know deer are actively feeding. By far, the most important part of that definition is that deer are actively feeding there. As I said yesterday, deer are creatures of habit when it comes to their food. If they are feeding on a particular tree, they will tend to continue to do so until something in their environment changes. Bear in mind that things are constantly changing in a deer's world, so a particular tree may be a dominant tree for only a couple days, or it could last for several weeks. So how do you know where the deer are actively feeding? Simple. Deer go poop (that's a scientific term that a wildlife biologist taught me. OK, maybe it was my daughter) where they eat. Disgusting but true. I don't know whether it's the process of eating that gets their constitution working or whether they poop all the time and just happen to be standing in one place while they eat. I don't guess it really matters to anyone but a deer. In a nutshell, finding a dominant tree is simply a narrowing down process of looking for mast producing tree species, finding the ones that are producing fresh mast, then finding the ones with fresh deer droppings underneath. 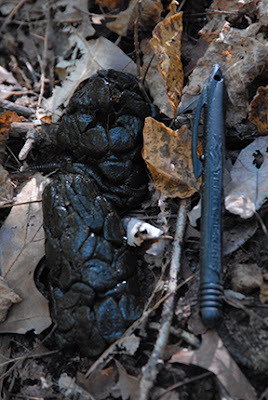 Here is a picture of one of the piles of droppings that we found under the white oak tree where I shot the 8 pointer featured in yesterday's post. The size of the droppings indicated a fairly large deer (the wind sensor case is 5.25 inches long). The moist surface told us that they were only several hours old, at the most. Some hunters (Ted) believe that clumped together droppings indicate that the "creator" was a buck. I'm not sure I would agree, but then again, I can't prove it wasn't. In the next article we'll talk about how to identify a dominant tree. At 49 years old, I'm new to the deer hunting scene. My question is once I find the "dominant" tree. Do I mark my way out, then setup the next morning with a climber? or do I setup right then and there and wait? I know this blog hasn't been used in a while... are you still answering questions? glsnj - The answer to your question is that it depends... THe first question I would ask myself is whether it makes any difference whether I hunt that spot in the morning or the evening. The answer to that usually depends on whether I can get in to the spot without disturbing the deer on the way in. For example, deer tend to go to open areas like pastures or agricultural crops during the night. If the dominant tree you've found requires you to pass through an area where the deer will be feeding at night, it would probably be better to hunt it in the afternoon. If, on the other hand, you can get to it without crossing through the field or if you have to pass through a bedding area, then it is probably a better morning spot. If none of that applies, then mark a trail and hunt it as soon as possible. I've had the best luck, statistically, the first time I hunt a spot. Each trip back and forth leaves scent that ups the odds spooking the deer. I know every piece of property is unique. In this particular situation, there are distinct areas an oak grove, a transition area ( brush, pines and little food source material )and a swamp. I already have ladder stands in the transition area close to the major runs. The oak grove is where they are feeding, it is also where the "dominant" tree resides. So I believe that is where they are primarily feeding. I believe they are bedding in the swamp. At least that is what it appears to be given the tracks. Unless you have another suggestion... I am scouring the net for all of the information and advice I can get my hands on... I plan to become one of the most knowledgeable morons in the NJ woods. I find this technique promising given the logic behind it.. I am new to deer hunting. This is only my second year of serious hunting. I said serious until I stumbled across you looking for some climbing stand reviews. First I would like to say your summit review was by far the best and most video I've found. So then one day I just decided to visit your website. I'm glad I did because before this I just found myself walking through the woods finding a place and thinking this place looks good there has to be deer here. Only to find myself with a stiff back and day dreams of squirrels turning into the mammoth 10 point bucks. So now I'm going to give this pursuit hunting a go because it all makes sense to me, once I get the run down on your navigating skills. I do have a few questions though. Do you do this style hunting all through gun season to closing date? Also, I work 5 days a week till 2:30, so by the time I get home and take care of a few things by the time I get in the woods it doesn't seem like I have a whole lot of daylight scouting time. So my next question is, when do you do your scouting? Outstanding stuff on hunting, in my opinion site owners should acquire a great deal out of this site which tell us the hunting rules and tips for a great hunt, is very helpful for hunting. Yes i am agree with you in 2nd paragraph . If you want hunting 1st you have complete knowledge about it. During the hunting you should be care on your self and try to go on hunting with best friends .